The Vivencia Dehesa project includes the development of new products with the excellent raw materials of our pastureland in Extremadura, Spain. 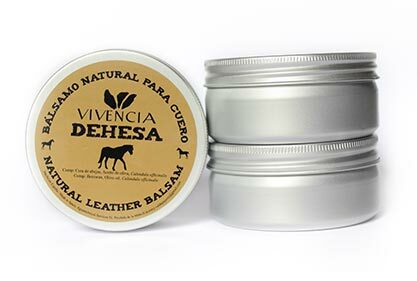 This line of natural leather care products includes Balm and Soap, based on natural cosmetic formulas, whose main ingredients are beeswax, olive oil and Calendula officinalis. These products provide intense and long lasting hydration, assuring impermeability and protection without a greasy sensation. 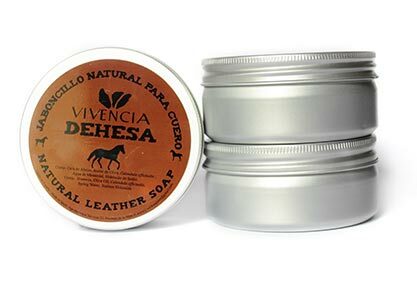 Our leather care products are handmade with 100% natural ingredients and provide natural care and protection to every kind of leather item. The balm is equally recommended to care for wooden items, books or antiques requiring special treatment. If you want to distribute our products in your shop please contact us via email and we will offer you a dealer price. vivenciadehesa@gmail.com . To clean leather, first remove any dust and dirt with with a damp sponge or cloth, it is not necessary to remove the soap as it has hydrating abilities. Once dry polish with a dry cloth. To nourish and hydrate, make sure the piece is dry, and then apply a thin layer of balm using a clean, dry sponge or cloth. 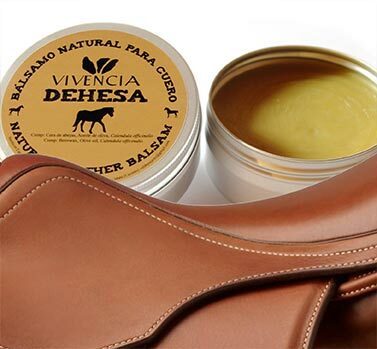 In cases of hard and dry leather, apply more layers of balm to the split taking care not to crack the grain. The balm is absorbed quickly and does not leave a greasy sensation. Once dry, polish with a dry cloth. Our balm creates a thin impermeable film resistant to marks. Both products are neutral, and can be used on any kind of leather, regardless of colour, tint and or tan.